Swiss photographer Eric Jaquier was a resident of Leeds in the late 60s, filling his time as a stay-at-home husband with photography of everyday life in Leeds. And 38 years later, those photos are on display in Leeds as part of the Strangely Familiar exhibition at PSL. 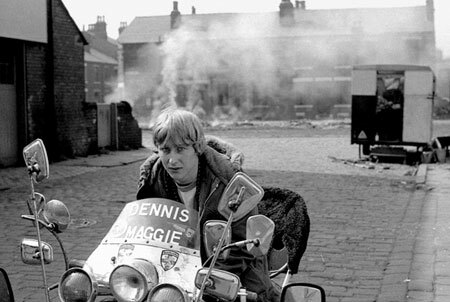 It’s now a great record of British working-class life in that era – everything from children playing in the street, houses and shops, city centre architecture, businessmen heading to work, people killing time around town – even mods on scooters, years after the movement’s heyday. The photos sit alongside more modern images by Peter Mitchell, comparing the city past and present. Strangely Familiar runs from 27th February – 10th May 2008. See the link below for information about the gallery. Seriously, contact me if you want more information about the history of that photograph!